When we are out on the go sometimes my son will not take a bottle but he is still hungry and fussy. I have been trying a few brands of food and have found a great on the go solution for feeding him fruit. My son is a very picky eater when it comes to fruit so I was surprised when he loved all the flavors of the Buddy Fruits I fed to him. He gladly ate them without me having to mix it with cereal or oatmeal. I feel like I have found a new use for the fruit pouches while we were out at the mall. I used a spoon and I squeezed a small amount of the fruit onto his spoon and feed it to him. This made for no spills and an easy clean up. Unlike most on the go foods I have used I usually have to toss out the remaining food since using the spoon directly in the food from his mouth contaminates it. I just put the lid back on and stored it in our little cooler bag for later. 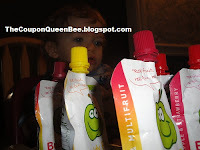 I had to taste them since they smell so wonderful fruity, I can see why my son loves them its very sweet and flavorful.The health benefits of fruit are already well known and each Buddy Fruit pouch is equal to one serving of fruit. This makes it easier for me to make sure he is getting at least one serving a day when he has one. ONLY fruit and nothing else! 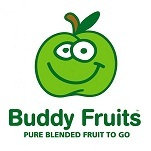 Buddy Fruits are available in Strawberry, Banana, and Multi Fruit. 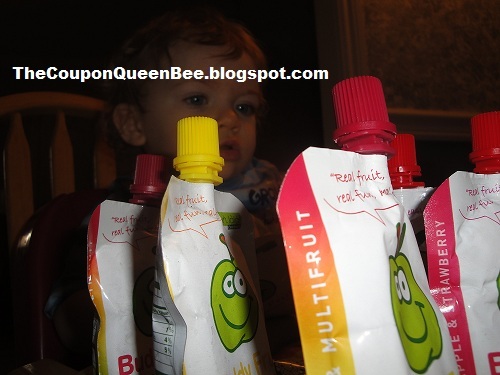 In honor of my son's 1st Birthday Buddy Fruits has agreed to send one of my lucky readers a set of Buddy Fruits (18 pouches). *Limited to US residents; 18 years old and above. Giveaway starts November 20, 2010 and ends December 4, 2010 at midnight PST. Winner will be emailed and has 48 hours to respond before another winner is selected. I was not paid for this giveaway or post. I was provided a free set of 18 pouches of Buddy Fruits to review. Me too! Love these things! Left comment on their page. I think I'll be ordering our next round in bulk! Their case price is much better than in-store prices.